Second Edition coming June 2019. A United States Marine Corps Elite Fighter Pilot was killed not in a aerial dogfight at 500 mph, but in action on the ground fighting in a Combat Mission. The word ‘Hero’ is not too strong a word for Sam, but you’d never know Sam’s extraordinary story of a life beautifully lived had Renée Nickell, Sam’s loving Sister not gone through the gut wrenching task of lovingly writing the book you now hold in your hand. This is a compelling real life story. From the publisher: Renee Nickell's brother, Major Samuel Griffith of the United States Marine Corps, was an F-18 aviator before transitioning to a Forward Air Controller, deploying to Afghanistan with the 4th ANGLICO. Sam tragically lost his life in combat on December 14, 2011. This is a story of a sister's journey after her Marine brother was killed in combat in Afghanistan. Journey with Renee through her life with Major Samuel Griffith, his death, her grief as a Gold Star Sibling, and how she found hope. Check out the reviews on GOODREADS! 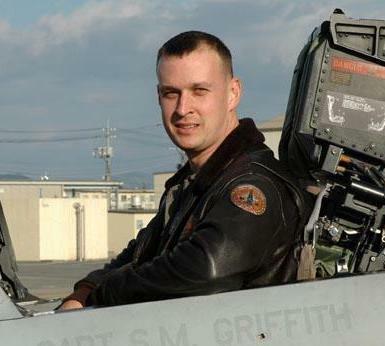 Renee Nickell’s brother, Major Samuel Griffith of the United States Marine Corps, was an F-18 aviator before transitioning to a Forward Air Controller, deploying to Afghanistan with the 4th ANGLICO. Sam tragically lost his life in combat on December 14, 2011. Sam was just two years older than Renee and his death devastated their entire family. Renee realized after his death, that there wasn’t much acknowledgement on the impacts of losing a sibling. This made the grieving process much more complicated. Through Renee’s grief journey, she had to rely on her faith to help her heal not only from Sam’s death, but also from painful experiences from her past. Six years after Sam’s death, Renee decided that she wanted to write a story that would honor her brother, bring awareness to the impacts of the death of a sibling, and bring others hope and healing by the telling of her own personal journey. Always My Hero, a memoir and tribute to Sam, has been a journey of re-living painful experiences and events, to create a story of inspiration to others that may find the healing process of losing a sibling an impossible feat. Look for Always My Hero AVAILABLE NOW! If you would like to volunteer your time or your financial support to help support our veterans and their families, please click the links below to learn more!